It’s the thin, white markings on Cinta’s otherwise black paws that are the first clue to her horrific past, evidence of being bound for days at a time. 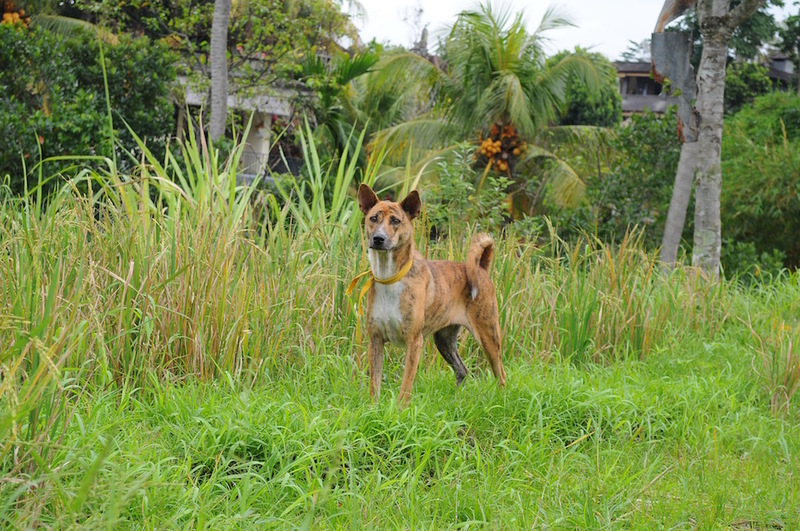 Cinta—whose name translates to ‘love’ in Bahasa—was rescued from a dog meat restaurant back in 2015, just one of an estimated 80 dog meat warungs (family-owned restaurants) found across the popular tourist destination of Bali. When I first spot Cinta, it is at the BAWA adoption house in the heart of Ubud’s city center. BAWA, which stands for the Bali Animal Welfare Association, is a not-for-profit organization founded in 2007 by American ex-pat Janice Girardi. 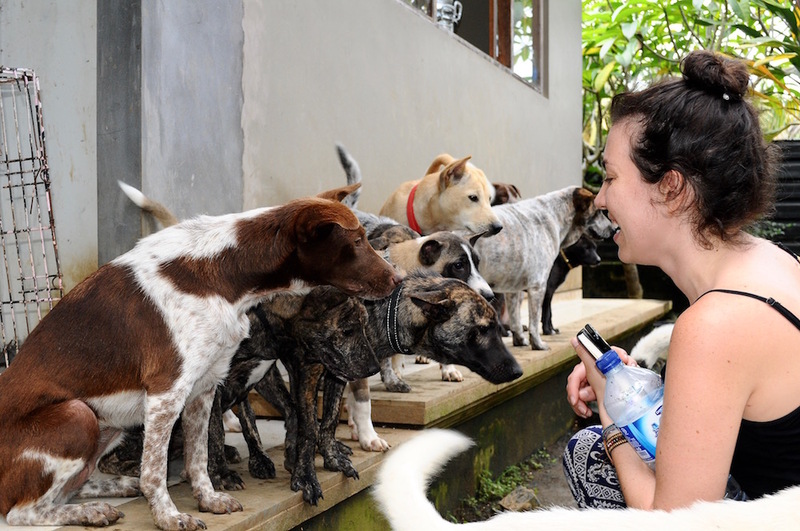 Committed to the improvement of animals’ lives on the island, BAWA offers emergency ambulance services, daily street feeding, animal rehabilitation and community education programs to promote animal welfare amongst the local Balinese. Working amid the many abuses—from cockfighting to other animal cruelty—that plague “the island of the Gods,” BAWA has been on the front lines of fighting the horrific dog meat trade. The rickety wooden gate of the BAWA adoption house swings opens to an inner courtyard, where a myriad of dogs stand eager to greet me with a symphony of barks and wagging tails. To the side, I spy a solitary black and white dog donning a simple yellow ribbon around her neck. As I approach Cinta, she seems to regard me with trepidation, as though measuring my character with those chocolate eyes that just unstitch me. 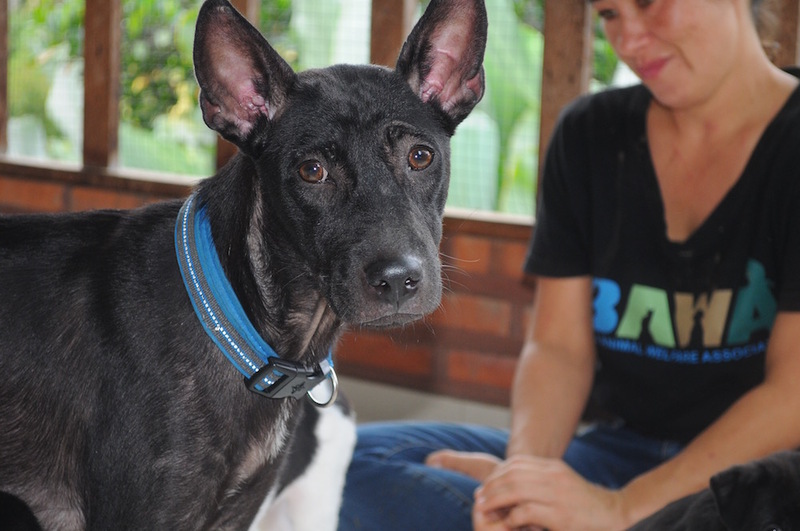 Originally found at the bottom of a cage with her front legs tied behind her, Cinta endured deep wounds to her paws and face by virtue of the local belief that dog meat tastes better the more the animal is tortured. According to research from BAWA, 70,000 dogs are slaughtered each year in Bali for the dog meat trade while 100 percent of those captured are killed in grotesque, inhumane ways. Cinta, who was rescued by BAWA, escaped a fate crueler than death. 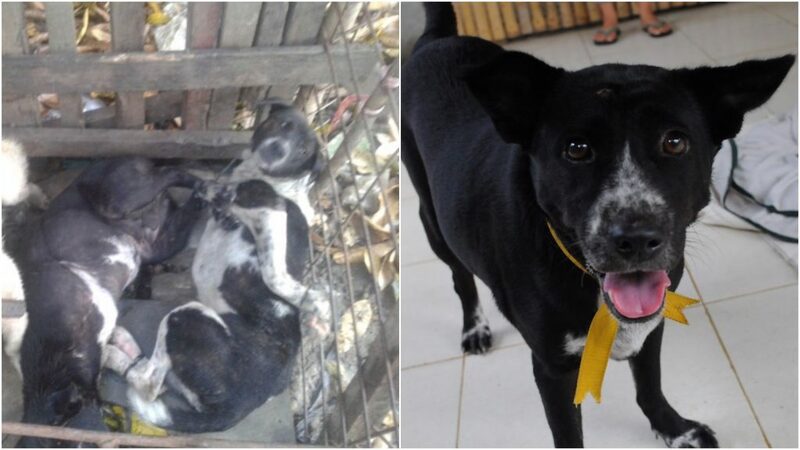 Roughly 70 percent of captured dogs in Bali are lassoed to a tree, partially strangled, and then butchered alive. Back in 2014, BAWA partnered with leading Indonesian and international animal welfare organizations in Jakarta to release the results of BAWA’s investigation of dog meat operations in all nine Bali regions over a time span of two years. 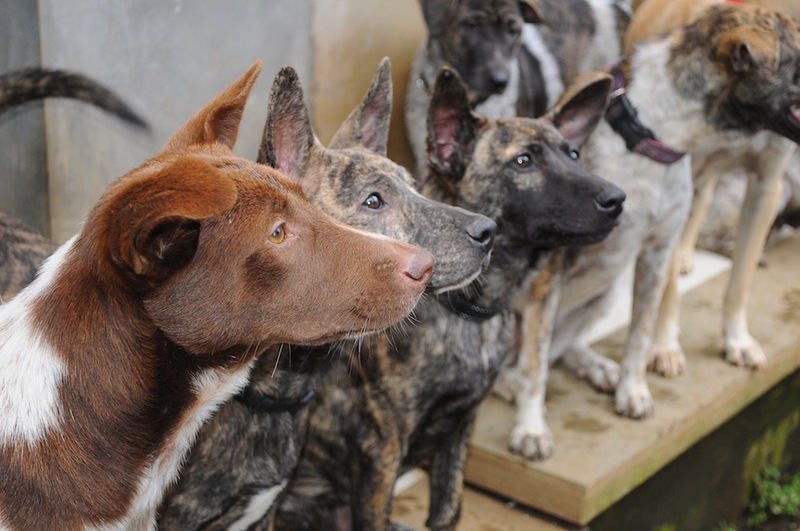 What was found is that 50 percent of dog meat consumers are native Balinese, while the other 50 percent hail from other parts of Indonesia—such as Flores, Sumatra and Medan—where eating dog is more prevalent. Indonesia is a predominantly Muslim country where eating dog meat is considered haraam or ‘unclean;’ but unlike pork, Islamic tradition does not forbid dog meat consumption. For poorer communities throughout Indonesia, dog meat provides an affordable alternative to beef, reports The New York Times. While Indonesia’s dog meat trade is hardly a new issue, Bali’s dog meat trade has recently snagged international headlines after an undercover investigation led by Animals Australia revealed that some tourists were being fed dog without their knowledge. “Behind 66 Beach in the tourist area of Seminyak, in southern Bali, a street vendor admits he’s selling dog to the undercover AA investigation,” reports a local Australian news channel. For Indonesia Tourism, the story is damaging to the meticulously cultivated perception that Bali is “paradise;” while for the growing number of tourists flocking to the small island, the news can be life threatening. Beyond the heart-wrenching reality of accidentally eating man’s best friend, many of Bali’s captured dogs are poisoned with lethal substances that humans may be consuming. 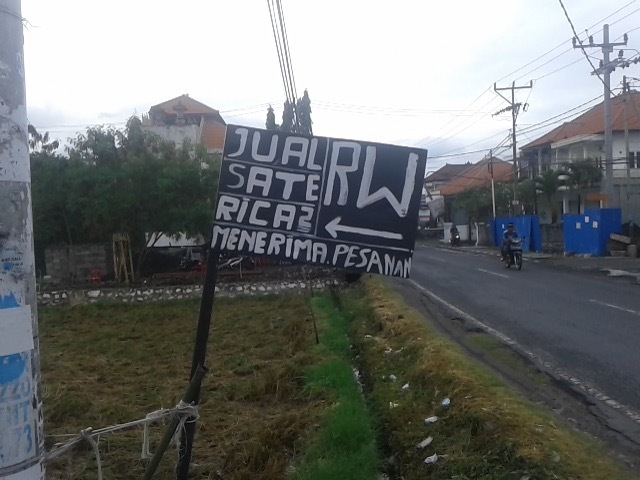 Typically, Balinese restaurants will denote dog meat with the abbreviation “RW,” which comes from the North Sulawesi term rintek wuuk, or “soft fur”. Over a four year time period, BAWA monitored 18 different banjars throughout Bali that were considered the worst of the worst when it came to animal care. 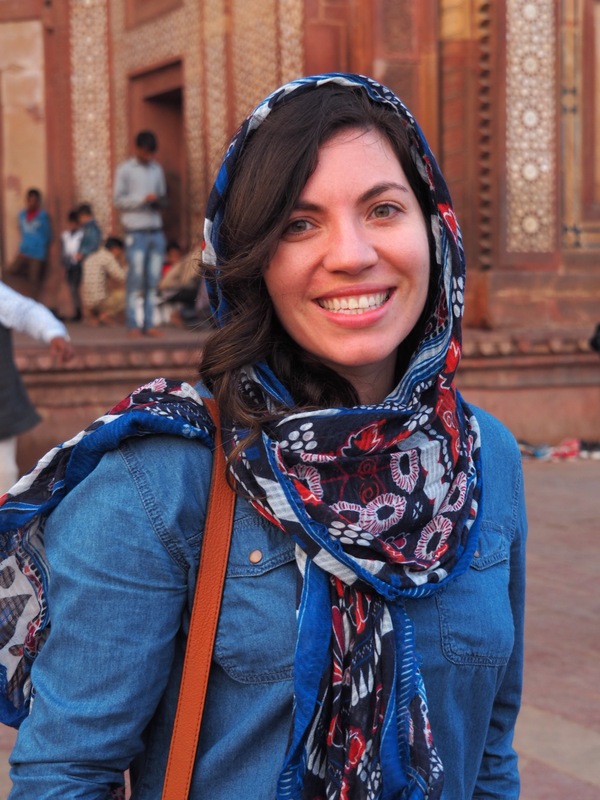 The locals in these communities would sell or give away dogs to dog meat traders in exchange for compensation, or simply throw away female puppies in an effort to control the stray dog population. Evening in Bali and as I wait for a taxi on the corner of Jl. Suweta and Jl. Raya Ubud, I spot a dog across the street laying limp on the sidewalk as another dog licks the black matted fur of his injured companion. The animal lays still with one paw flung over his face as though hiding himself from the flow of pedestrian traffic. On his backside, there appears to be an open abscess. I stand watching, frozen by the scene unfolding in front of me, thinking of what I could possibly do at this moment other than walk away. Remembering BAWA has an ambulance for animals, I begin to look up the number as I stand above the dogs. As I search, an elderly Balinese man mutters something in Bahasa before aggressively tossing a can at the injured dog’s head. I stand horrified at the blatant, unwarranted cruelty towards this helpless animal, watching sadly as the black dog limps off quickly while his friend trails behind him. In a country where there are no set laws against dog meat trading and inadequate animal protection laws, where older generations view dogs as a commodity to be treated as such, it seems the only key to saving Bali’s animals is through the education of the island’s children. BAWA aims to teach young children compassion and empathy towards animals, instilling in them at a young age that animals have emotions, can feel fear, pain, sadness, and can be loyal companions. BAWA focuses on changing the mindsets of Bali’s future generations, as it may well be the only sustainable answer there is to solve the island’s dog meat problem. A day or two later, I find myself sitting at a local cafe on the outskirts of Ubud. The no-name, open-air restaurant is simple—a wooden shack with no menu and four tables, I come to indulge in the vegetarian Nasi Goreng. Across the road, I spot local children playing barefoot in the dust while a collarless puppy tag along behind them. I wait to see how the children will treat the dog compared to the elderly man from the night before; whether they’ll push it away, be cruel or throw objects at the curious stray. I hold my breath as the puppy approaches and one of the kids drops to his knees, bringing his face to the dog’s snout, and begins to lovingly pet the animal. Perhaps there’s hope for Bali’s dogs after all. *My story originally appeared on Culture Trip.